Recently, I splurged on a magazine. Now generally one would not put the words 'splurge' and 'magazine' in a sentence together, particularly when the former is referring to the latter. But I did. 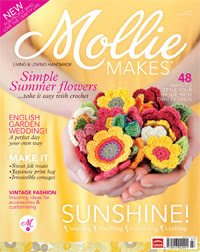 It was Mollie Makes. A lady at my Brown Owls got issue one from a friend in England and brought it to share and we all ooh-ed and ahh-ed over it. So much pretty, lovely stuff. So I looked online at how much a subscription would cost. And it was $222.69 for a year. This seemed a bit astronomical to me so I decided that maybe I would just treat myself to one. The cost of one magazine didn't seem like much compared to $222 so I hit buy and processed my credit card before I sat back and really thought it through. Ridiculous amount to spend on a magazine when you think of it. I could have bought a new book for that and had 8+ hours of quality reading time instead of just 1 hour. It arrived the other day and I was excited in suitable proportions to the price I paid for it and it was a good one hour read but really, when you can't buy half the stuff in it without having to pay almost $222 in postage from England to get it to Australia, I don't know if it's really worth it. I will take it to the next Brown Owls for everyone else to drool over though. The cost of magazines from overseas is totally ridiculous, but I am glad you gave in and treated yourself. I always think that a magazine can be forever and for the same cost, four pots of tea is for a few hours!! I've seen this about on the internet and it looks good. You never know, it might be in your local newsagency one day. My last impulse buy was a book, last in a trilogy, saw it in the bookshop and bought it this morning.